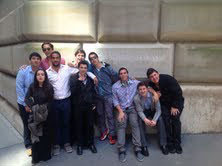 Federal Reserve Bank of NY Financial Literacy Event Article - The Eve Fenton Love-All Foundation, Inc.
On Monday April 30th 2012, a group of students from Baruch College & Magen David High School visited the Federal Reserve Bank of New York for a Financial Literacy event. This event was run through the Eve Fenton Love-All Foundation and was coordinated by Mr. Daniel Kamelhar. This program was designed to show students about how the money system in this country works. They were showed a video of the circulation of money, how money in this country has evolved and changed. They saw bills of 5,000 & 10,000 dollars that are no longer in circulation. The goal of this trip is monetary policy to learn about what the Federal Reserve Bank is all about, and what impact it has on everybody’s everyday life. How it affects student loans, to car loans, to mortgages to credit cards and even something as simple their everyday savings account in their local bank. It is always one thing to see things like this on TV, or read about it in a newspaper but to experience it in real life gives the true understanding a third dimension to what our countries federal reserve banking system is all about. As an added bonus the students were taken to lowest point in NYC and were able to see one of the world’s largest vaults which they learned houses not only our countries gold but also gold from private investors who pay rent to store it down there for safety. This learning experience was made possible by the striving motivation of the Eve Fenton Love All Foundation which strives to help students of all age better understand Financial Literacy. This trip was coordinated and ran by Mr. Daniel Kamelhar an educator who has been working to promote financial literacy himself throughout high school and college students.